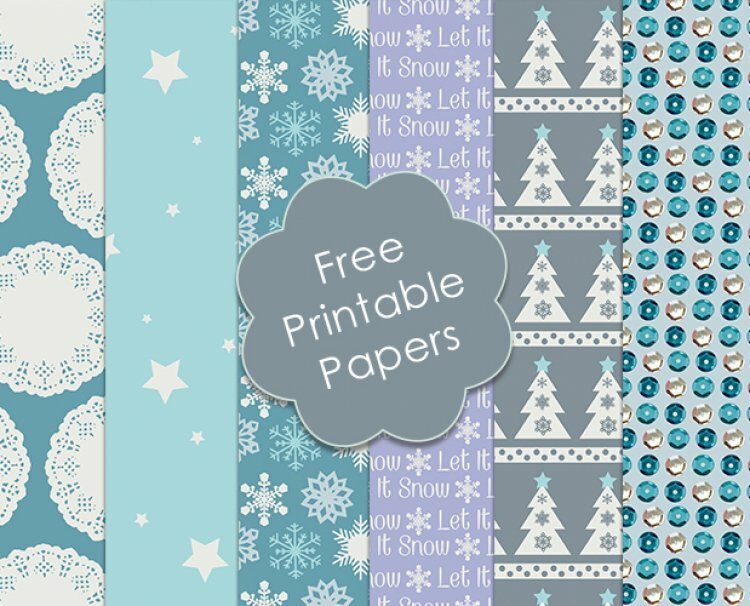 With their gorgeous Frozen theme colour palette, our snowflake and sequin prints will add sparkle and delight to your handmade projects, save the papers and print off as many as you need. 1.Cut a piece of star print backing paper 14.5 cm square, adhere a 12cm square piece of snowflake paper to it and on top of that a strip of Let it Snow paper trimmed to 14.5cm x 6cm. Wrap a piece of twine across the front of the card. Adhere to the card blank. 2. Die cut to snowflakes using blue Dovecraft glitter card, cut one in half and glue as shown on the card. Place the other snowflake in the centre of the card. 3. Add a square diamante charm to the centre of the snowflake to finish. 1. Cut a 12cm x 15cm piece of light blue textured cardstock; adhere to the centre of the bag. 2. Trim a piece of sequin backing paper to 13.5cm x 21cm, adhere to the cardstock. 3. Add a strip from the tree backing paper to the bottom. 4. Make a tag using the textured cardstock approx 12cm x 8cm, mat and layer with a piece of tree print backing paper. Punch a hole at the top, use twine to attach to the bag. We would love to see your festive projects made with the free papers! Remember to share your creations on our project gallery to inspire your fellow crafters.